Dodge Avenger Forum : Dodge Avenger Forums > Vendors > CARiD.com > Buy 4 selected Cooper Tires and Get Up To $70 Rebate! Hello folks! We are back with a special reward offer on Cooper Tires! 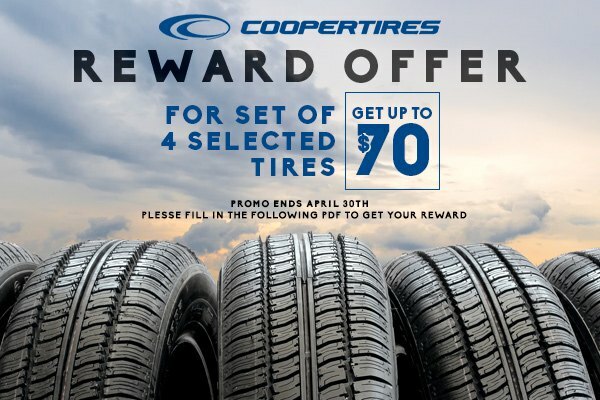 Purchase a set of 4 COOPER CS5 grand/ultra tires till March 31, and get up to $70 rebate. Cooper tires provide real-life performance, in real-life conditions for everyday drivers. They feature wear square visual indicator of 5 stages, advanced compound formulation, 3D micro-gauge sipes and increased biting edges for improved handling and traction. These car tires are designed to meet your highest requirements, ensure superb performance, excellent cornering, and steering response. Don't miss your chance to buy a new set of Cooper Tires and save your money! Please complete the following PDF to get your rebate.